A unique selling point of 90006 is that she has two different named nameplates on either side of her bodywork which dates back to the time when the 90 worked the West Coast.In the early 2000's, the 90 transferred to the Great Eastern region in order to replace the then aging class 86s. Owing to engineering work in the Shenfield area, services from Norwich to London started & terminated at Witham. This is a shot of 90006 awaiting her next departure from Witham to Norwich. This loco is unique in that she has two different named nameplates which dates back to When the 90 worked on the West Coast for Virgin. Here we can see the name “Roger Ford” on one side of the loco. On a bitterly cold grey winters morning after a recent dusting of snow, 90006 has been captured pausing at Diss with the 07:00 London Liverpool Street to Norwich service (1p06). This is a shot of 90006 taken by the level crossing at Ingatestone in a position of safety with an express service from Norwich to Shenfield. Network Rail were carrying out engineering work on the route on this day. And another shot of 90006 at Witham on the above date, this time at the other end of the train depicting the DVT against the platform signal and station furniture. 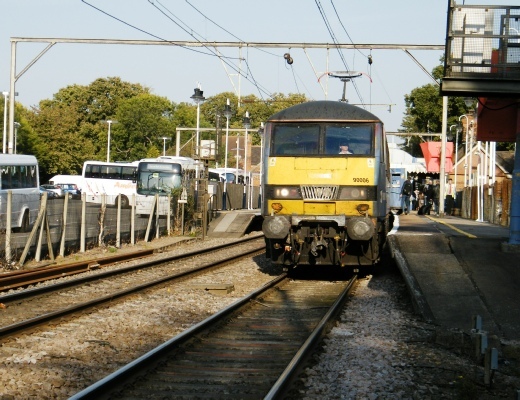 The service was travelling to Norwich. On the other side of 90006 she displays the name “Modern Railways Magazine” again dates back to her days with Virgin. This view shows a nameplate in need of some loving care.